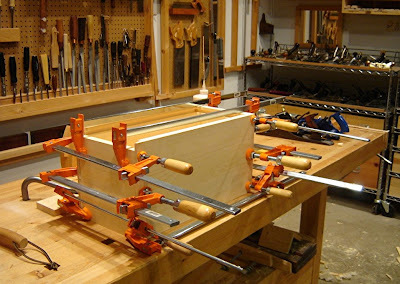 "What about curves; don't you need a bandsaw for those?" 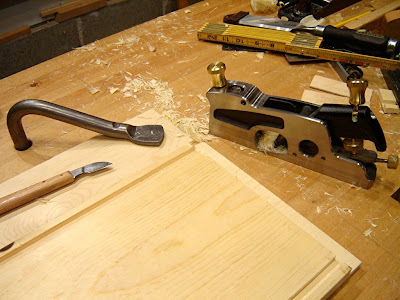 This question, or something similar, is one that often comes up when I discuss woodworking using only hand tools. 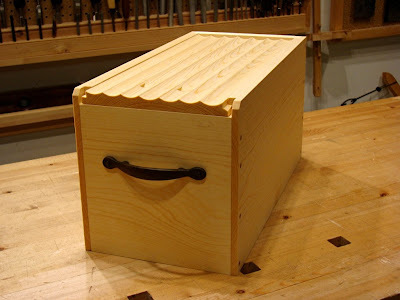 It's a natural question, but there are at least two reasons why the answer is "Nope, you don't need a bandsaw." This post is a casual exploration and comparison of these two reasons. I was not being scientific, or particularly picky about final finish. Just a quick, fun comparison of two different approaches to the same task. First, I needed the curves. I chose to lay out an ogee curve as I though it might be more fair to compare making both concave and convex curves. 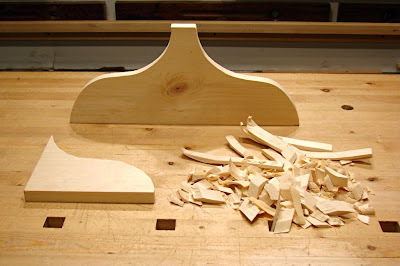 Not too bad - probably not as fast as using a bandsaw, but certainly not slow - at least in my book. 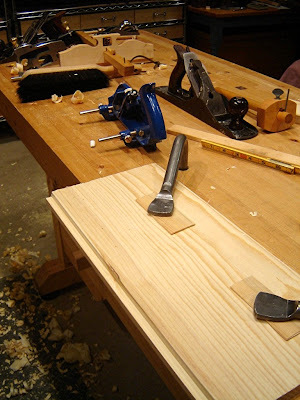 Another difference is that if you don't have spokeshaves, careful work with a sharp drawknife can produce an acceptable surface. 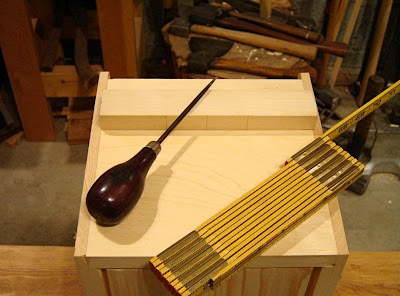 Also, the drawknife could produce a faceted surface, if that is what you wanted. 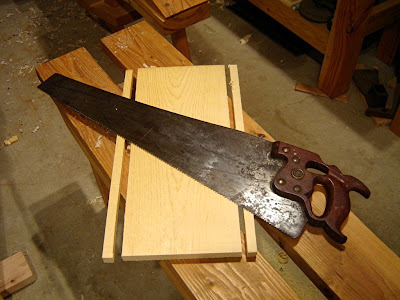 Of course, using the bowsaw is a lot less scary than holding 10 inches of sharp steel between your hands. 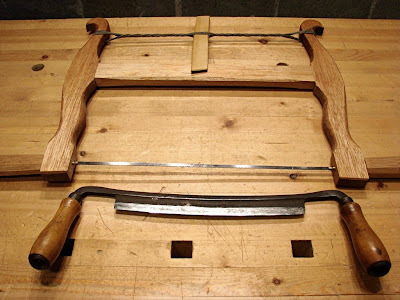 I've never hurt myself with a bowsaw, which is something I can't say about a drawknife. 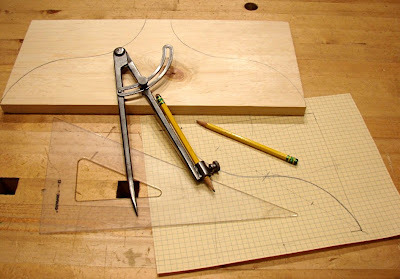 So, to wrap up, both of these hand tool approaches will produce curves without resorting to using a bandsaw. Both take about the same amount of time. 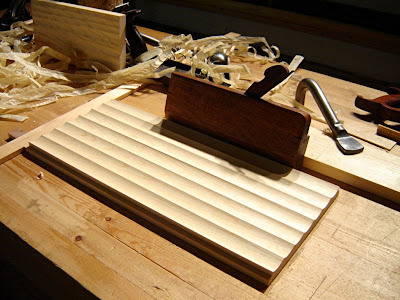 And both will allow you to say "Nope, you don't need a bandsaw." 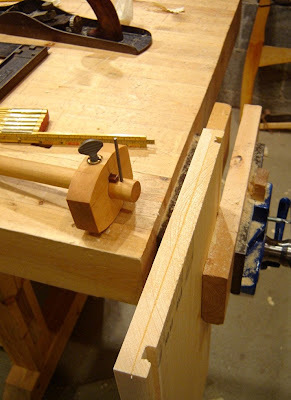 After taking the box out of the clamps, it was time to clean up the joints. Not too bad - it just fit in the vise. 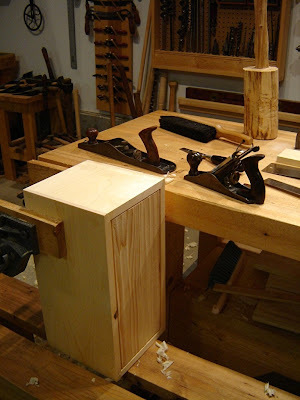 I was careful not to put too much pressure on it and pop a corner, and with the box resting on my saw bench, it really didn't need much clamping pressure to be very steady. Now it was time to make the lid. 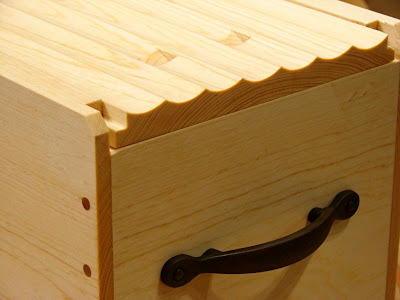 I could see the end of the project in sight - the lid was a straight forward affair - just cut to width, three rabbets and done. I'd be finished in less than an hour, what could happen? 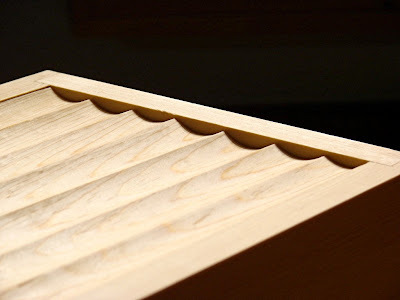 I used the extension slide on my folding rule to measure the width of the lid from the bottoms of the two grooves. After getting the dimension, I marked the lid stock for ripping. 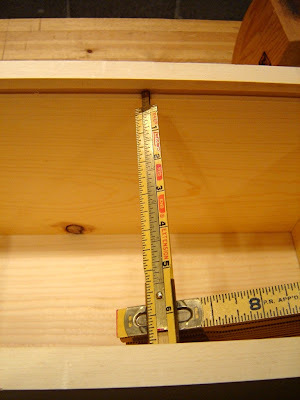 Normally, I true an edge and then use a panel gauge to mark the waste to be cut off the far side. 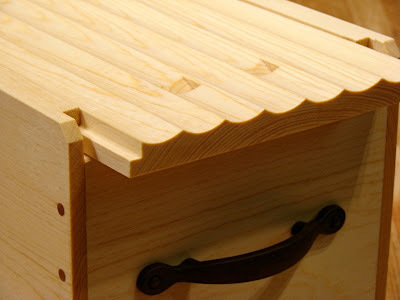 Here however, I wanted the grain pattern to remain centered on the lid. So I trued one edge, made the second parallel, and then marked in from both edges 1/2 the amount to be removed. A little more work, but it made for a much nicer looking lid. I ripped the two edges off. I tried to rip as close to the lay-out lines as possible without removing them. Then I used a plane to work down to the gauged line. I love how the cut line itself shows you when you are close by peeling up in a long curl. If both arrises peel at the same time, the edge is working square. As you can see in this shot, most of the left arris had already peeled - telling me that I was slightly out of square - easy to fix in a few passes of the plane. 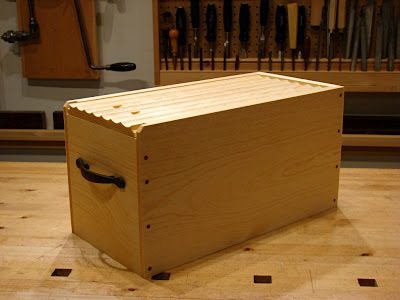 With the lid cut to size, I planed the rabbets and gave the lid a test fit. Too tight. A closer look revealed that all four surfaces needed to be relieved slightly. I took it very slow - too much removed and the lid action would be sloppy. I knew from experience, that the perfect fit would feel too snug at first, but after several times of sliding in and out, it would loosen up a hair and be just right. However, I also had to think about movement. It's been very damp here lately and the relative humidity is right around 75%. But all too soon, the temperature will plummet and the moisture content will drop with it. 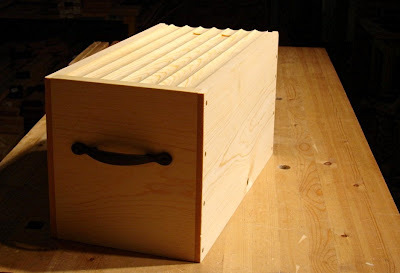 By the middle of winter the relative humidity will be down in the low teens and the lid will shrink a little, so I wanted to make it as tight as possible now, but still remain functional. 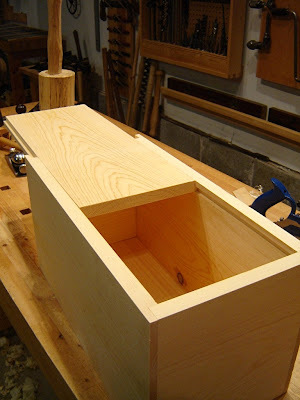 Several test fits, with minimal planing between, and the lid slid home. I was done! Mostly anyway. 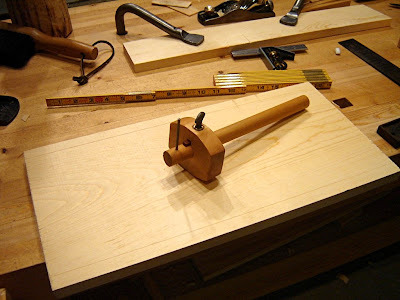 Just peg the joints and add the handles. And even though I was behind schedule, I had so far managed to stick to the general plan and not over complicate things with new ideas. But - one problem. I didn't like it. I found it - well boring. Bummer. Not that it wasn't a nice box - it was. It just didn't have much in the way of character. I didn't feel like this box represented "me". It needed something, but what? I looked at it from different angles. 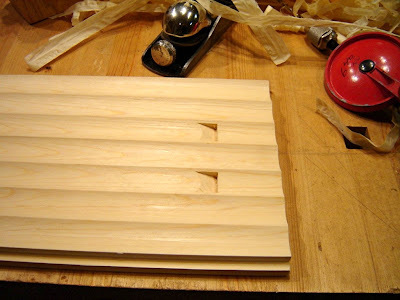 I mocked up various moldings. I thought about building a skirt or low base. I tested out some feet ideas. Nope, nope, nope and nope. Nothing was making me happy. I was already a day over schedule and here I was complicating things. If I messed up the lid, I'd have to make a new one, out of different stock, which wouldn't match the rest of the box. Plus, it would take another day and I wouldn't be able to present to my students. What should I do? I took a deep breath, and had at it. 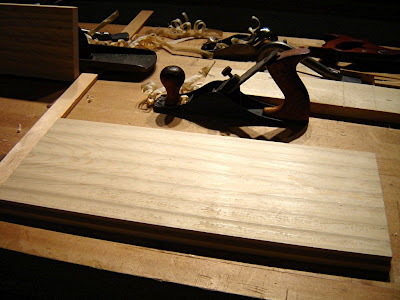 Here's the results after the scrub plane - a lot of tear out is visible in the raking light. 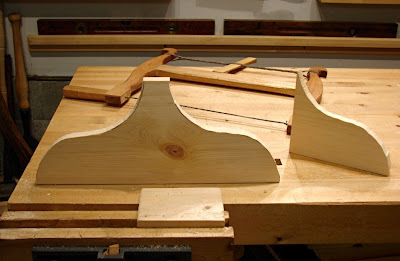 And here is a shot of the bench at the end of the lid shaping process. You can see a test piece leaning against the maul behind the finished lid. 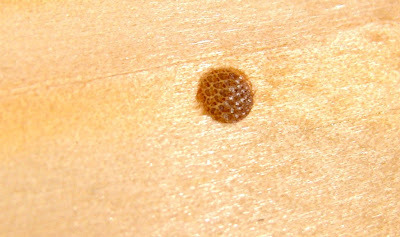 Part way through I was still getting tear out (I was sure it was ruined) and I had to stop and sharpen the plane blade. 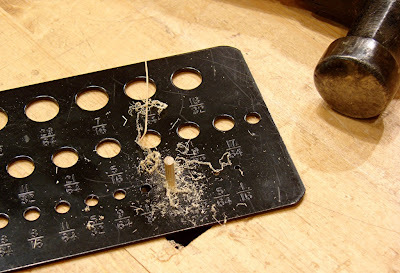 I used this piece of scrap to check if it was successful - thankfully it was. 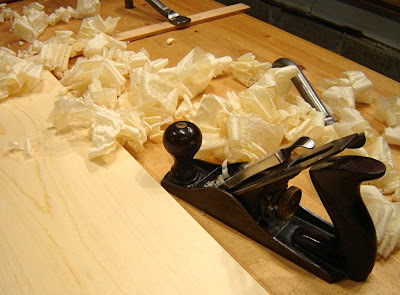 I love the shavings that the round plane made. 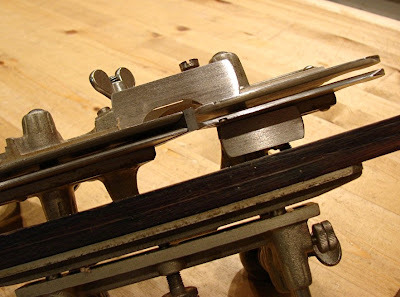 Freshly sharpened, and set very fine, this 150+ year old plane was a true joy to use. Thank you J. Kellogg! Best of all, the new and improved lid gave the box the character it was missing. Yes! 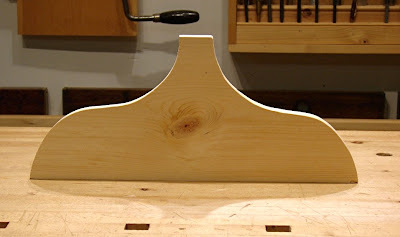 And I made a template to help with boring the holes in the ends for the handles. I loaded it up with my "me" items (packed in the shavings from making the box), took it to school and presented it to my students. I was very pleased that the box itself told as much, maybe more, about me than the items I put inside. A "Me Box" indeed. 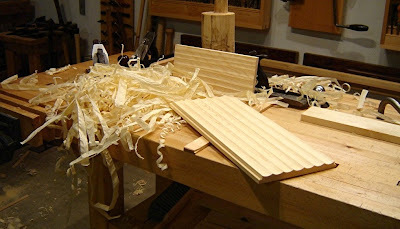 After plowing the grooves, it was time to cut the sides and ends to length. Which meant it was time to come up with actual dimensions. 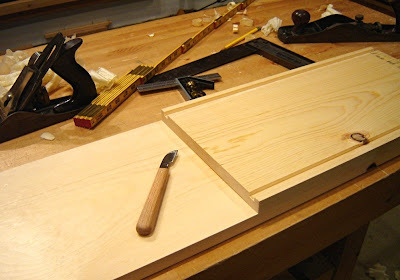 Since I wanted the bottom and the top to be made without gluing up wider panels (this was supposed to be a quick and simple one day project), and as my stock was 1x10 (actual width 9 1/4") I set the width of the box at 8 inches. This left enough stock for the sides to be 18". I laid-out the first side, and cut it to length. First problem. I was out of practice, and the cut was pretty bad. It needed to be squared up with a plane. Second problem. 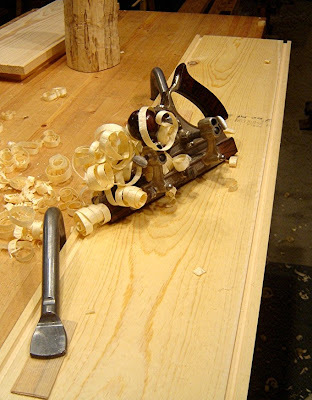 I was using one of my newer planes, a Stanley 62 bevel up jack plane. 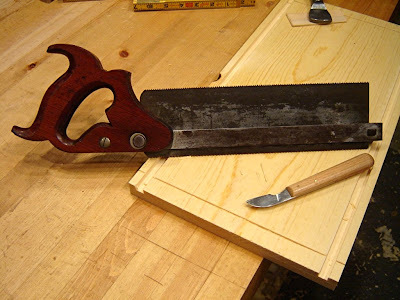 It cuts beautifully, but I had a dickens of a time getting the end square to the face. I'd check it with the square, plane a bit - way off! Huh. Plane again, and - way off in the other direction! Now, I'm not St. Roy, but this job I can usually handle without really thinking about it. What was going on? After much frustration, I think I finally figured it out. It was the plane (always blame your tools - just kidding!). I should clarify. It wasn't something the plane was doing; it was something it was making me do, or not do in this case. 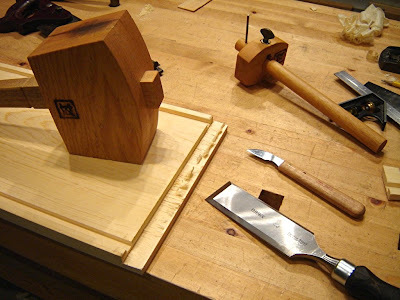 When I use my regular #5 jack plane, I extend my index finger and rest it on the edge of the iron just in front of the tote. On the #62, the iron is much lower (no frog) and without the iron to rest my finger on, I was not extending it. 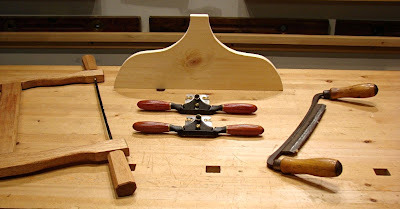 I was using a full four finger grip on the tote, and without that finger extended, my feedback was lacking; similar to depth perception using only one eye. It's weird how such a small detail can have such a huge, and incredibly frustrating impact. I'm sure I could learn to compensate in time, but my solution for this project was to just extend the index finger out into space - it felt odd, but it worked. 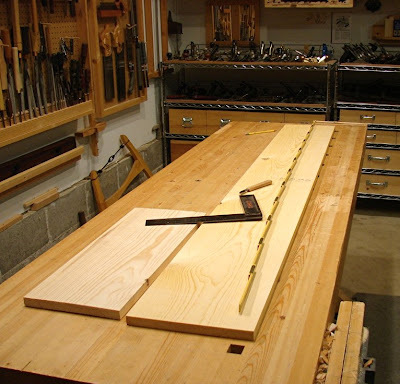 Between the sawing and planing fiascoes, my 18" side was now shorter than 18". No worries, I just used that part to layout the opposite side - as long as they were both the same length, the box would be square. 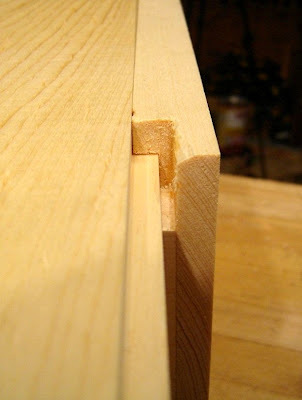 With all the parts cut to size, I needed to create the corner joints. 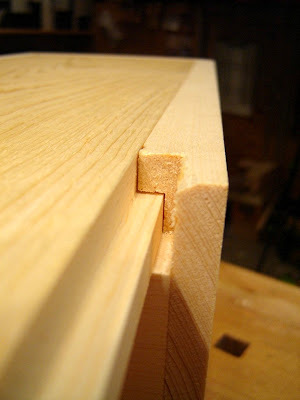 I was tempted to go with dovetails, but I was way behind schedule (oh so easy to do when your schedule is not realistic in the first place) and decided I would just go with my standard pegged rabbet joint. 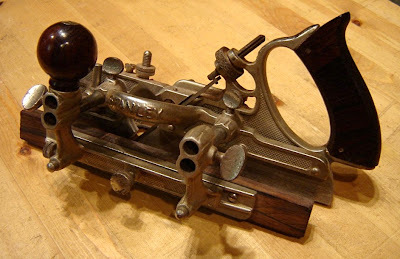 I could have used a rabbet plane, but on cross grain work they require a nicker to sever the grain, and as the nicker cuts deeper than the iron the nicker cut is visible on the final joint. 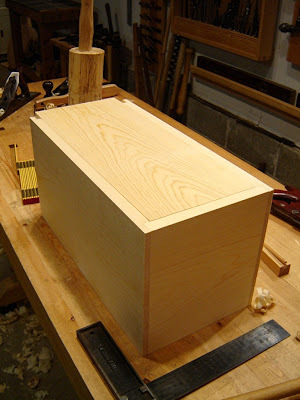 This isn't a big deal if the joint is hidden, but on this box it will be right on top, and I didn't want that nicker cut detracting from the clean joint. 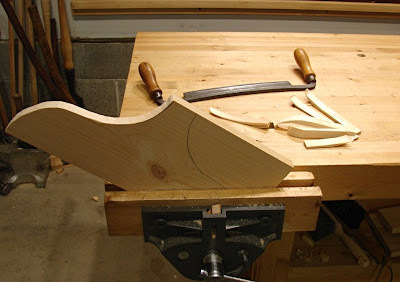 After that it was simple to clean up the cheek with a shoulder plane. Wait! Can I do that? 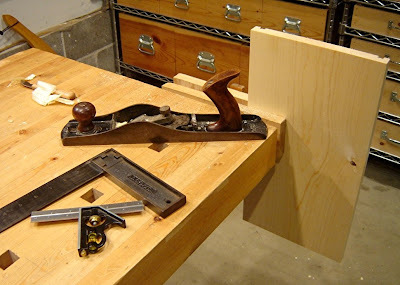 Wouldn't that require a "cheek plane"? Oh English! Time was up, and I didn't have a box yet. Although, that was actually very fitting for a "Me Box" - one of my defining characteristics is absolutely no "time reality" as my wife likes to call it. This project grew out of an assignment my teaching partner and I gave our 7th grade students: create a "me box". A "me box" is a shoebox with carefully selected items that represent your interests, hobbies, goals, personal history, family etc. After gathering their items, and decorating their boxes, each student gave a presentation to share their box with the class. Of course, we made our own "me boxes" too, to share with our students. I believe that regular readers of this blog will be familiar with my propensity for complicating even the simplest project. Well, it happened again. I found myself with some extra time and thought, "Wait. I have a great idea! Instead of all the "me" stuff being in the box, what if it IS the box too! That would be cool!" And right there, my weekend got swallowed up. I added the shorter piece, as the longer, nicer piece was too short to make all six parts of the box in the size I had in mind. The grain and color didn't really match, but I planned on using it for the bottom panel, so I didn't care. 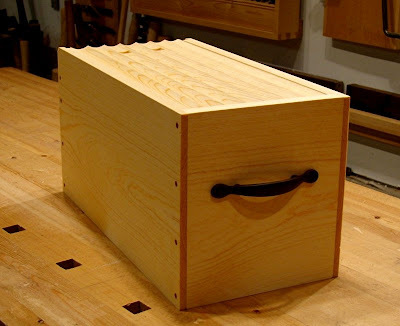 The sides and ends of this box have two grooves each for the floating bottom panel and the sliding lid. 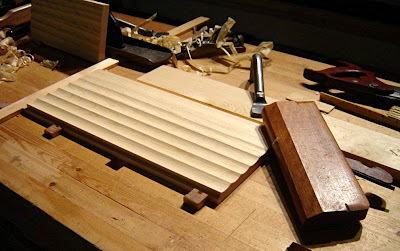 I actually remembered to plow the grooves before cutting the parts to length. I always forget this, and it makes the job a lot easier if you do it all at once. Really though, these things are great at plowing grooves. 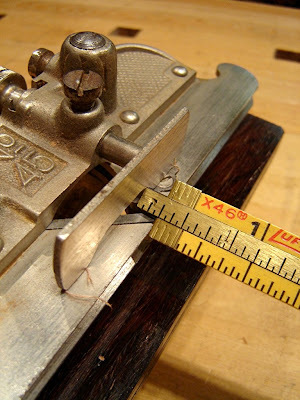 Make sure the cutter is sharp, and the skates adjusted correctly to support both edges of the cutter. After the 45 was adjusted, and the board held securely with holdfasts, it was quick work to plow the grooves. The chalk marks on the board were to remind me which side I was grooving. After mistakenly plowing the grooves on my chosen "face" side on numerous occasions in the past, I finally got wise and adopted this system. 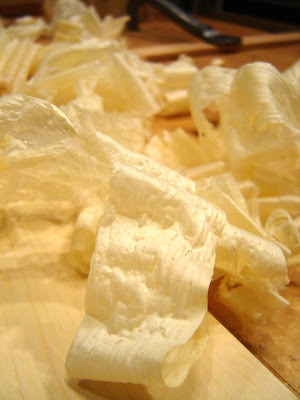 The shavings from the plow are on the thick side, (I set the cutter more for speed than a smooth finish) but they do curl nicely. 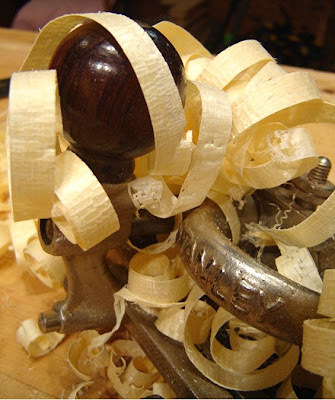 ...making my favorite kind of shavings. I go through a lot of bamboo skewers in my shop. I use them to stir paint, apply glue, cap glue bottles, etc. I also frequently use them as pins or plugs in my projects. I like the size, the price is great, and I enjoy the look of the finished piece. They do however have one major drawback - they are rarely round. The most usual defect is a lump, or ridge, that runs the length of the skewer. They also can vary significantly in diameter. While these defects in no way interfere with the paint stirring ability of the skewers, they can make for some very messy looking pegs. 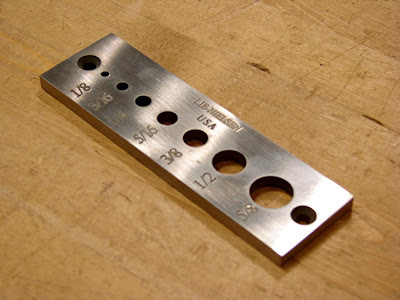 I used to dig through whole packs of skewers trying to find the best ones, all the while thinking "If only my LN dowel plate had holes smaller than 1/8th." But then, "Eureka!" I hit on an easy fix. 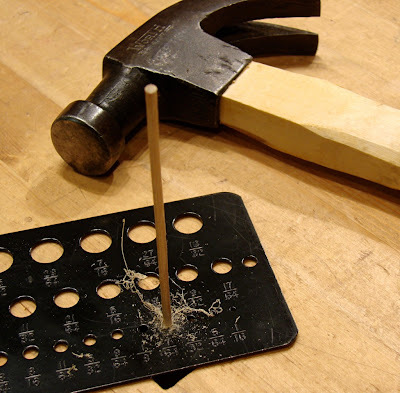 I took my metal drill gauge and tried using it as a dowel plate with the skewers. The gauge is not exactly beefy, but then again neither are the skewers - it works great. I find that the 7/64ths hole gives me consistantly round skewers with the least amount of effort or waste. After I drive them through the gauge, I cut them with a knife. 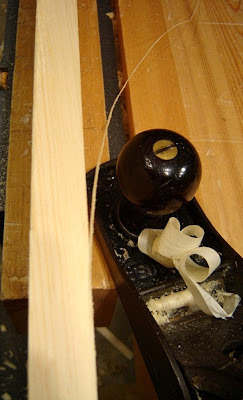 A rolling action makes the cleanest cut, and avoids the skewer's tendency to splinter or shred. The end result is a much cleaner look.